I have not written a post about our asparagus project till now, I am calling it a “project” because I look at this experience as practical training. For the last 5 years, I have been reading any book I can get my hands on about organic/sustainable farming practices and building soil health, which evidently are one in the same topic. It has become my passion to understand the microbiological relationships that happen in the ground and how these interactions result in healthier plants and ultimately healthier people. 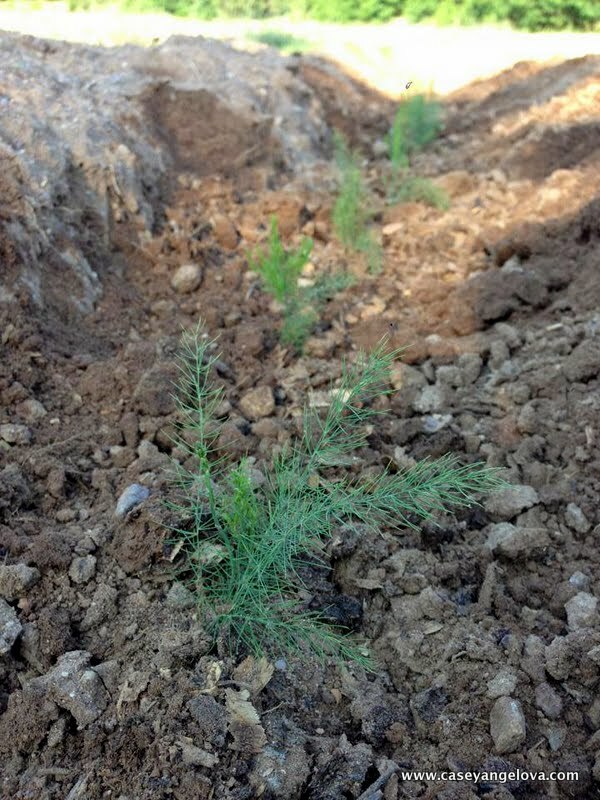 The idea of planting asparagus started right about the time I saw that they were selling asparagus in Sofia, if you could call those limp and shriveled green spears asparagus. When I saw the cost of these substandard vegetables, about 10 – 12lv a bunch that lead to me purchasing my first package of seeds. This was back in 2008 and needless to say, my thumb was still a bit black. I managed to get one plant that survived, but my total harvest was about one spear and only after two years, I forgot the plant was even there. My passion for agriculture sprang out of my first love of cooking. 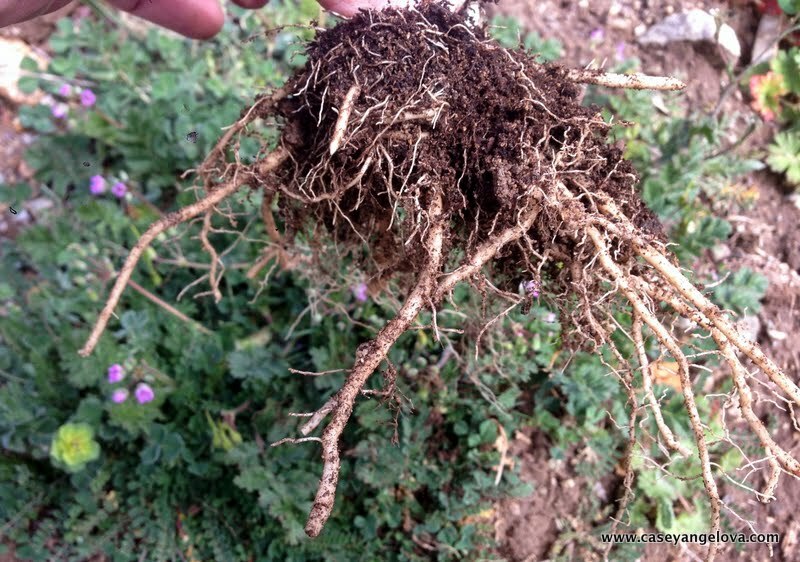 I felt unable to create the meals that I wanted without the proper ingredients, so this was how I began my connection with the soil. I think with any undertaking, one is always in the process of learning and honing their craft. There is no end game. While there is an art and science to cooking, I find growing good food infinitely more difficult than cooking, but that could be because I still don’t have a solid foundation about the science involved in agriculture. 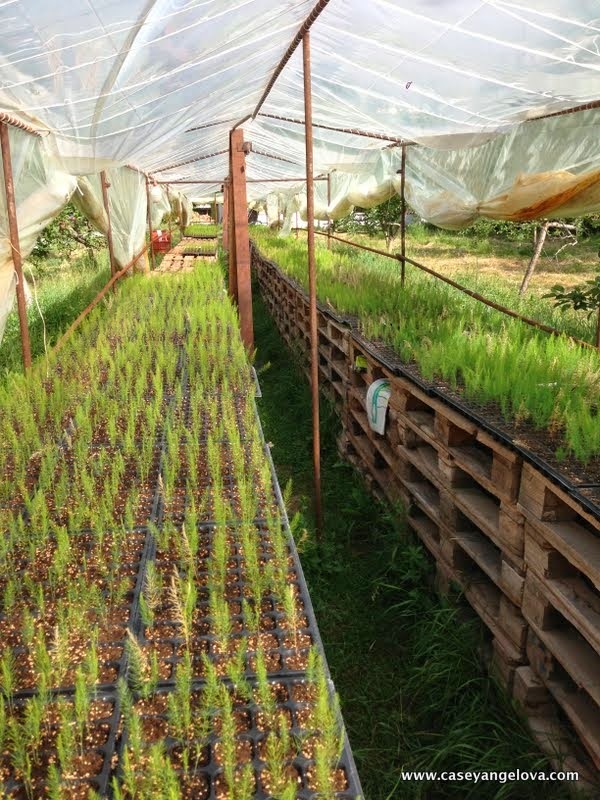 In the beginning of 2013, we built our greenhouse, purchased our seeds and set out to germinate 15,000 asparagus plants. 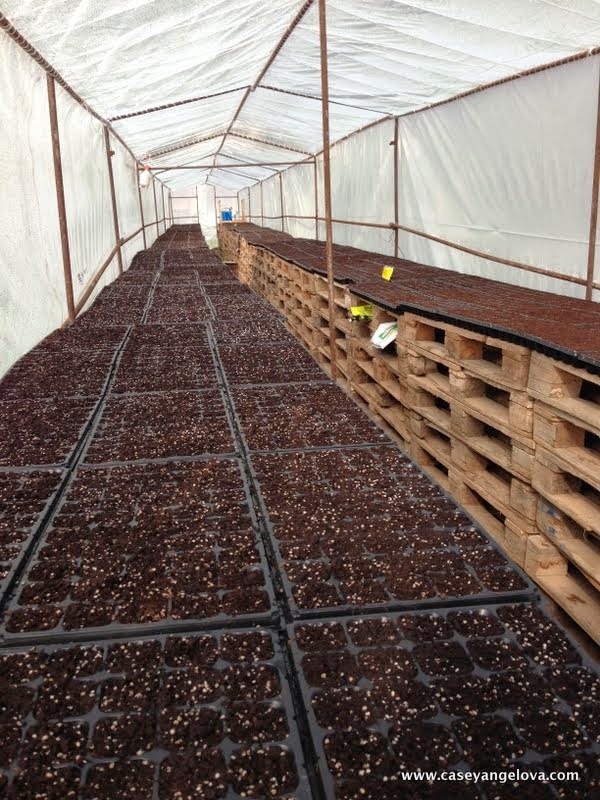 We only needed about 5,000-7,000 plants to fill our field, a little more than 3 decacres (.3 ha or a bit less than an acre) We figured that 70% is a typical germination rate, plus we decided to grow heirloom varieties; Mary Washington and Conover’s Colossal, which are non-hybrid seeds that include both male and female, so we would need to cull out half of them to only have the male plants remaining. The reason we want only the male plants is that they produce a higher yield, since they don’t devote any energy in to seed production, plus if the females drop seed, we will have to make sure that new plants don’t germinate. After many hours of planting seeds, one by one, the greenhouse was full. Our tasks in the interim was to keep the temperature steady for germination and the soil moist, but we were racked with fear. What if they don’t grow, what if this was all a waste of time? Every day for weeks we stared at the seed cells looking for any sign of life, occasionally something would pop up, but we didn’t actually know what an asparagus seedling looked like, so the internet was our best friend during this period. 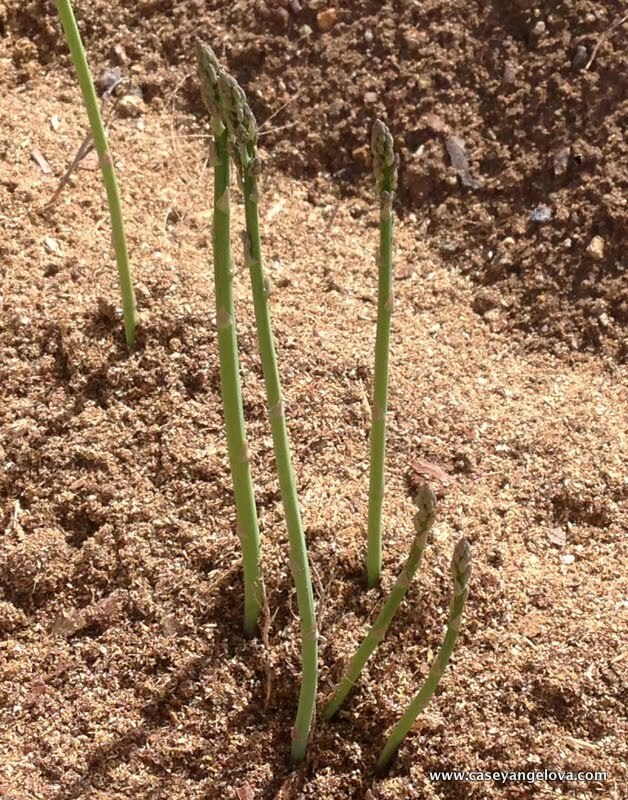 When an actual asparagus plant finally emerged it was a relief, only 14,999 to go. Eventually they all began popping up, literally almost all of them. 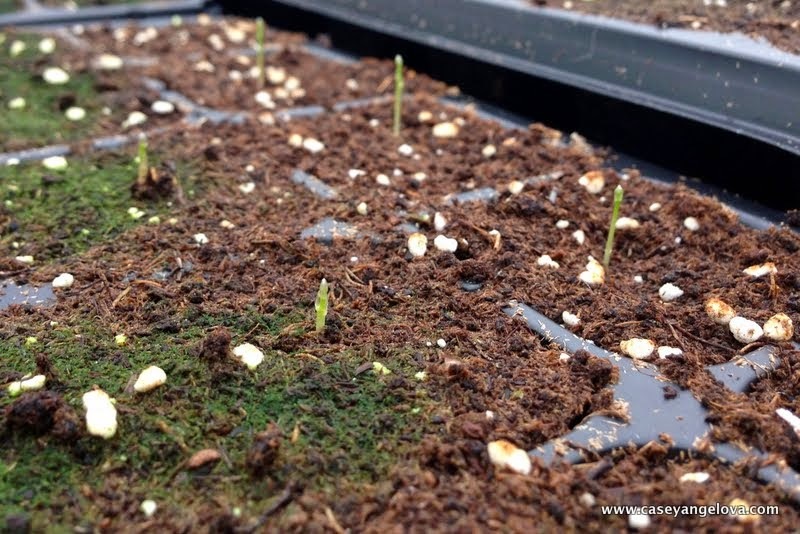 Our germination rate was above 95%. We now had a lot more asparagus than we anticipated. As with the seed germination, the field preparation was also frightening. Decisions needed to be made, which were all based on my knowledge gained from reading and research. I had the theory down, but now pulling the trigger and giving instructions about the specifics was daunting. I found myself filled with self doubt. 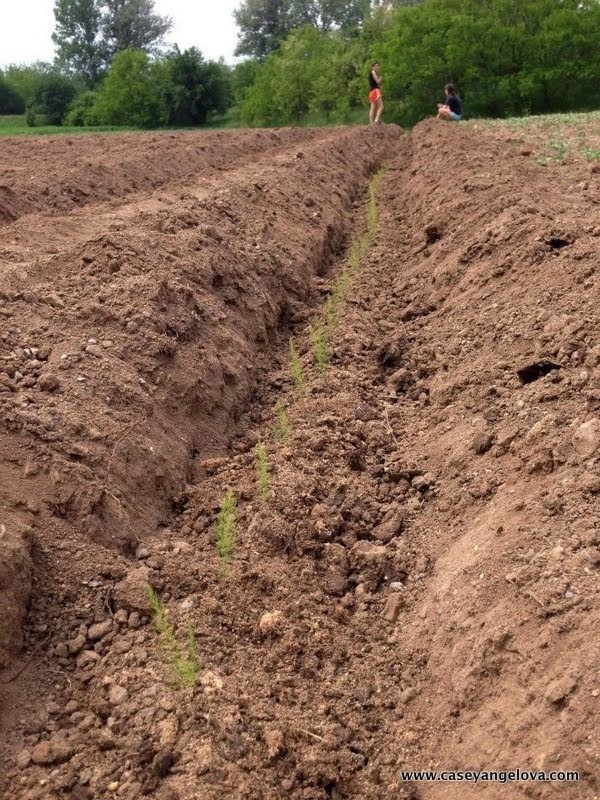 Because of the size of this undertaking, we needed to hire extra helpers, but no one even knew what asparagus was, let alone how to cultivate it. A theme that will follow us through this project began to emerge that things take significantly longer to complete than you expect, which created problems. We didn’t adequately prepare the field in advance, which left us scrambling to make good decision based on limited resources. Asparagus are not annuals, but perennials. They will be in this field for 20-30 years… hopefully! We finally got everything sorted out and the asparagus plants in the ground. We really pushed some of the limits, since the temperature was so hot during the end of planting we worried about the survival rates and plant stress of our little transplants. We ended up with such a large quantity that we planted them closer together in order to move the one year old root stock to places where loss might occurred. Through out our hot and dry summer, watering was a nightmare. We had managed to dig a well, which was significantly more effective than filling up 10L bottles of water from the river, but now we are watering with a hose, which is also not very effective or sustainable, not to mention time consuming. Our idea was to put in place a gravity fed drip irrigation system, but our field is very isolated and we don’t have fences beside a rustic acacia barrier to keep out the sheep, goats and horses, which by the way don’t like asparagus, if they did we would have been wiped out. Shepard here don’t respect other farmers fields. If we had installed this watering system there is a very good chance that it will be stolen. It is a sad reality, but we need to weigh the cost of an irrigation system or manual labor. We are still debating these ideas now as our presumably dry summer is upon us. This post was inspired by my first inspection of the field this year. 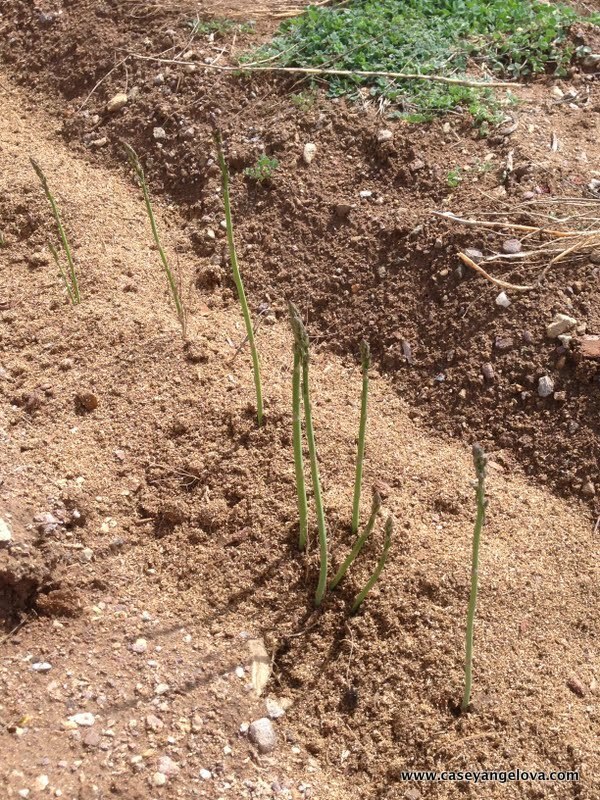 I walked row by row through the asparagus, some of the plants were growing beautifully, full rows filled with tall, soon to be bushy stalks, while other rows were almost barren, showing minimal signs of life. These rows were problematic last year, which could be due either to transplant stress, insufficient watering or winter, we can not say for sure, but I was disheartened to see such a large amount of losses. Over a year has past since we have put the first seed to soil. We are now moving into year two and there are many new decisions that are before us, such as what to do with the weed growth on top of the rows, how do we irrigate, what sort of soil amendments do we need, how to effectively manage weeding and for me the largest question is how and when to thin the closely spaced plants. I couldn’t move them before the spears started emerging because I didn’t know where they were, but now that they have sprouted will I damage the roots and future growth by moving them now? Or will the damage be worse if I wait till the fall when the roots have even further established? I have done some reading, but none of it is concrete. The decision ultimately lies with me and I need to make it quickly. 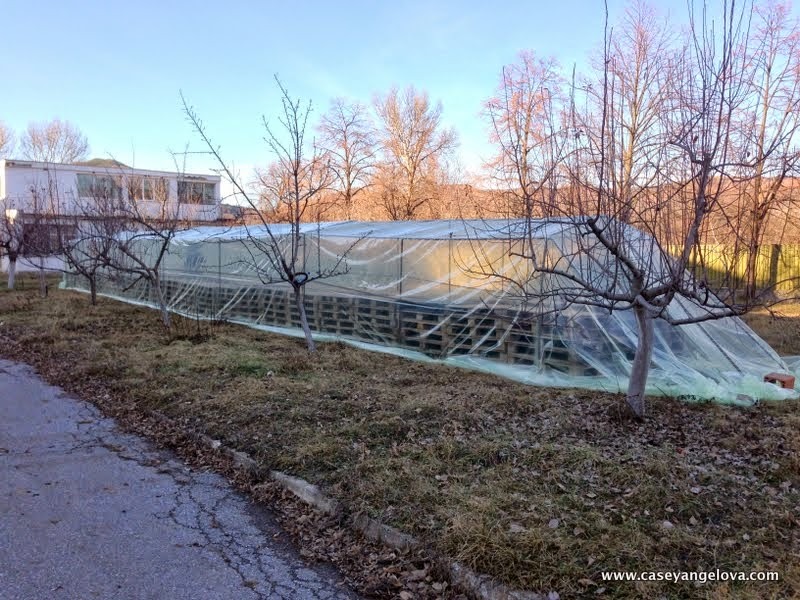 The worst case scenario is that we need to start new seeds next winter to compensate for the losses, but I think the learning experience will be worth it in the future, maybe not for our project, but to help others interesting in growing asparagus. Ultimately, the knowledge I gain from my work, I hope to be able to share it with young farmers. 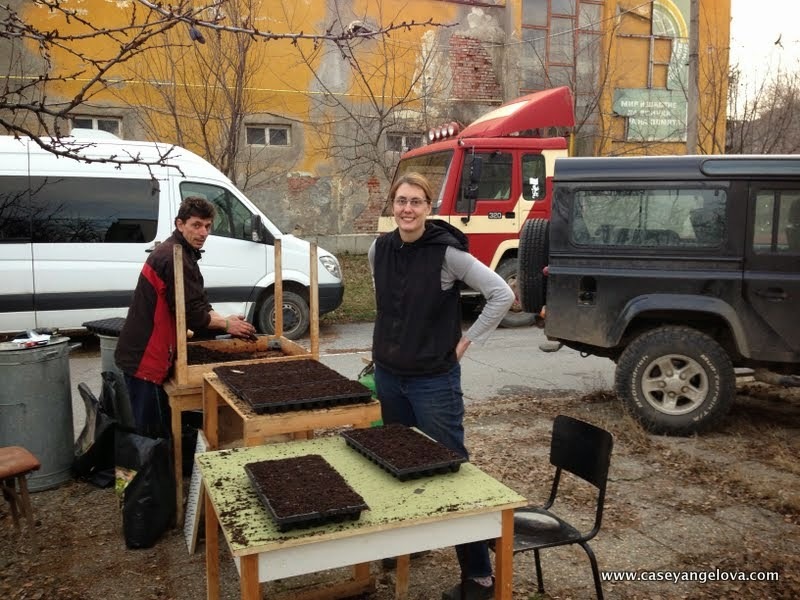 If in 5 – 10 years you are visiting Kyustendil, I would be more than happy to welcome you to the Angelov’s Farm Sustainable Agriculture Center… That sound like a pretty good name.